AT&T is now using drones to conduct aerial inspections of its cellular towers and foresees them as a way to beef up its wireless LTE network. Down the road, the carrier said it might use a drone as a Flying Cell on Wings (COW) to enhance LTE coverage at a large concert or sporting event where thousands of fans can clog the network. Or a drone could be used in rapid disaster response, offering wireless coverage when a vehicle is unable to drive to an area hit by a storm or other catastrophe. Future possible applications include turning a drone into a Flying Cell on Wings to beef up LTE coverage at a concert or to quickly set up LTE service in a disaster-ridden area. Some of those ideas were laid out in a blog this week by John Donovan, chief strategy officer for AT&T. 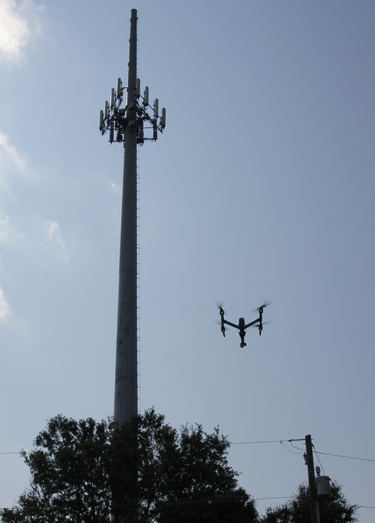 The blog includes a video showing how drones are already being deployed to inspect tall cell towers. The inspection drones use live video fed wirelessly to an engineer in an office who can do up-close inspections of cables and components high above the ground. The process is quicker and safer than using humans and allows access to parts of a tower that a person could not access. Drones can also be connected to an LTE network in a specific area to capture data for analysis through remote AT&T servers to allow for networking changes and fixes in real time if problems occur. Art Pregler, drone program director for AT&T, said the drone inspection information tends to be more accurate than what's been available in the past. "This is exciting," he said. "We're in the infancy of drone use in the commercial sector. The sky's the limit." As drones continue to evolve, so do robots and artificial intelligence, he noted. "We can see all of this coming together in a very interesting man-machine relationship," Pregler said. AT&T is also exploring the use of drones for use by its business customers in developing Internet of Things (IoT) applications in insurance, farming, facility inspections and delivery service, Donovan said. Interest in the commercial use of drones is quickly expanding. Google and Amazon have drone projects in the works as does Verizon—a direct competitor to AT&T. Last December, Verizon announced a pilot project with drone partner PrecisionHawk to monitor a grape crop at Hahn Estate, a winery in Soledad, Calif. Verizon said it wants to the use the pilot to help develop mapping and analytics for agribusiness. The interest by both major U.S. carriers in IoT applications for customers comes as wireless services revenues are on a steady decline. Carriers are seeking new areas of revenue with IoT—including by using drones.